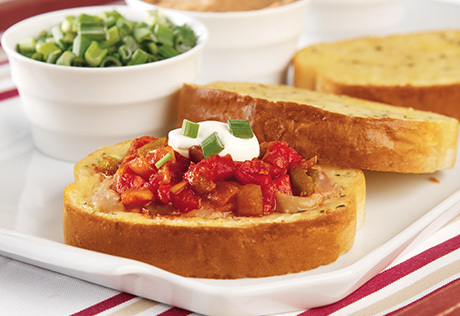 Easy to make and absolutely delish, this appetizer features Texas Toast topped with refried beans, sour cream, chopped green onions and salsa. Spread 1 tablespoon refried beans on each toast slice. Bake in the heated 425°F. oven for 2 minutes or until the refried beans are hot. Top the toast slices with the salsa, sour cream and green onion.